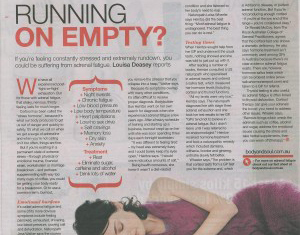 Just recently I was interviewed for an article in the Body and Soul lift-out of the Sunday newspaper, titled “Running on Empty“, about adrenal fatigue. Being one of the few practitioners in Australia who specialise in this area, it was very gratifying to have the issue of adrenal fatigue bought into the public arena in such a mainstream publication. And it linked to my Saliva Hormone Testing website, which was very exciting! I highly recommend saliva testing for checking adrenal function – it is a much more reliable and sensitive test than blood testing for this issue. “How to pin-point if you’re suffering from adrenal fatigue. We have all experienced post- ‘fight-or-flight’ exhaustion. But for those with adrenal fatigue, that shaky, nervous, thirsty feeling lasts for much longer. Cortisol has been called the “stress hormone”, because it’s what our body produces to get us out of danger and quickly to safety. It’s what we call on when we get a surge of adrenaline and when you’re not calling on it too often, things are fine. Next post: Who Knew Raw Could Taste So Good?